Come this November, Hawaii voters will consider whether to approve a state constitutional amendment that would allow the Legislature to levy a “surcharge” on “investment real property,” ostensibly for the purpose of funding public education. But would that proposal work as planned? Proponents have been vague on which properties would see a tax hike and by how much. We do know, however, that supporters hope it will raise hundreds of millions of dollars a year. This seems like a good time to point out that it’s one thing to raise taxes enough to produce certain amount of revenue, but actual results can vary. Consider the Philadelphia soda excise tax of 1.5 cents an ounce of sugar-sweetened and diet sodas that went into effect in January 2017. The new tax was projected to raise $46 million for pre-K public school programs. But just a few months in, revenues were 14 percent lower than expected, endangering the very programs it was meant to fund. In simple terms, the tax changed people’s behavior. Soda sales inside the city fell dramatically, while just outside its borders they increased by 38 percent. Philadelphia residents became 40 percent less likely to drink soda, choosing water instead. Of course, a soda tax isn’t the same as a property tax. For one thing, it doesn’t encourage higher rents and flight from the city. Which brings us to Chicago. "The bottom line is, an increase in property taxes increases the cost of holding the asset, which in this case is real estate. The owner will need to cover that additional cost, and increasing the rent is the swiftest way to do it." Today, Chicago leads the nation in population loss, as residents flee to escape the high cost of living. High property costs, pension liabilities, a high cost of living, and people leaving for greener pastures ... Sound familiar? Defenders of Hawaii’s proposed property “surcharge” say it is intended to apply to only high-value properties. But that doesn't mean it would yield the revenues desired. Evidence shows that people often respond in ways that tax and regulation proponents hadn't anticipated. 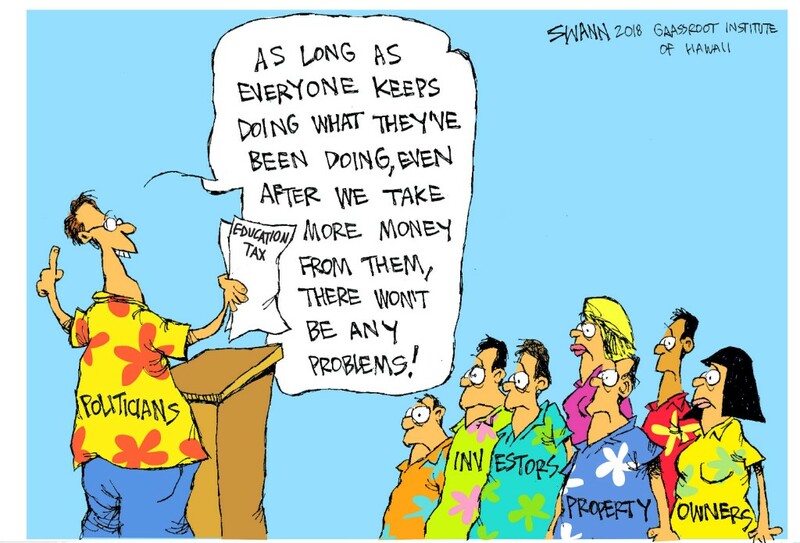 Why does it matter that Hawaii property owners and investors might not respond as anticipated and thus defeat the intent of the education tax? Because the vague wording of the proposed amendment suggests a blank check to the Legislature. Which means that state legislators would have to choose between expanding who gets taxed or accepting that the tax didn’t raise as much money as planned. Which do you think they would choose?